What If Everything We’re Being Told About U.S.-North Korea Tensions Is Wrong? A North Korean delegation will attend a large multilateral economic summit in Beijing next week, China’s Foreign Ministry announced Tuesday, underlining its reluctance to join American efforts to completely isolate the regime in Pyongyang. The problem, of course, is that this isn’t the sanctioned tactic. When Trump and his crew said they wanted China to step up on North Korea, what they meant was they wanted China to join in on the sanctions and the international condemnation — in other words, the demonization of Kim Jong-un. Take, for instance, the reaction of former vice president Joe Biden’s deputy national security advisor, Ely Ratnor, to news of China’s invitation to North Korea. “Beijing publicly taking foot off gas on pressuring North Korea. Is this what Trump means when he says Xi is ‘doing an amazing job as a leader’?” Ratnor wrote on Twitter Tuesday. Ratnor failed to note, however, that China has publicly stated all along that trying to muscle out Kim’s regime is the absolute wrong strategy, and that the diplomatic approach is the way to go. Even among U.S. allies in the region, diplomatic negotiation is preferable to military confrontation. As of Tuesday, South Korea has a new president, Moon Jae-in, and he’s a man who agrees with China that the U.S. should back off with the warships and allow discussions to resume. In fact, Moon says that under his leadership, South Korea should be the party leading talks with its neighbor to the north. It should also be noted that both Moon and China’s President Xi Jinping have said negotiations with North Korea will end before they even begin if the Hermit Kingdom doesn’t first agree to certain concessions on its nuclear program. So here we have a global superpower offering an olive branch via an invitation to an economic summit and a new regional leader who has said, in effect, that his country is willing to take the responsibility of de-escalating tensions. One might be forgiven for thinking the U.S. presence in Asia is no longer needed, even in the context of the mainstream narrative that’s been splashing across news feeds for those previously mentioned weeks upon weeks. But the warships will stay. The aircraft carriers will stay. The joint annual military drills with allies in the region will continue. And the United States, as Donald Trump himself has said, will have a strong presence in Asia for a very long time. The reason for this has perhaps been there, in plain sight, all along — the Belt and Road Initiative. This grand undertaking, birthed and led by China, is a push to create a permanent trade route connecting China, Africa, and Europe. Infrastructure investment alone would be worth billions, and it doesn’t require much of an imagination to envision the type of vibrant economic zones that would crop up under that level of international cooperation. On that front, China has said any nation can contribute to the future prosperity of the “One Belt, One Road” initiative. But leave the foolishness at home. It’s about commerce, China says, and peaceful exchange. And it means any nation. It proved that Tuesday because the economic summit China just invited North Korea to is the Belt and Road Forum for International Cooperation. That’s the olive branch China just extended to Kim Jong-un. It’s saying North Korea, even under the Kim regime, can get in on the action. But again, as with any other nation, the country would first have to knock off the antics. Perhaps Donald Trump saw this all along. Perhaps that’s what’s been behind all his fiery China rhetoric from the beginning. The Belt and Road Initiative, after all, has been in the works since 2013. And the Donald, first and foremost, is a businessman. Maybe he sensed it all was inevitable, that the Initiative would be a success, and that in the not-too-distant future there would be a rich, competing trade route established in a far-off part of the world — a notion that would spark jealousy in the heart of even the feeblest of money grubbers. So maybe he never had any intention of having his military fire on North Korea. Maybe he’s not concerned about the country’s nuclear weapons at all. Maybe it was all just an excuse to build up military hardware in the waters of East and Southeast Asia. That’s the extreme eastern leg of this new “Silk Road” proposed by China. Ships would sail straight through the South China Sea, where China has built artificial islands and fortified them with military hardware. Smart thinking, some might say, if you’re providing security for trillions of dollars’ worth of goods being shipped through those waters. Maybe all this North Korea craziness was always just a rouse to establish military muscle — again, for the long-term — in a region where a whole lot of dollars could soon be flowing. Recall that staunch ally Japan is right there with one of the world’s most powerful navies. Perhaps all this was just the United States forcing its way into a physical seat at the Silk Road table and saying to all parties involved that America refuses to be cut, quite literally, out of the loop. That reality, such as it is, would certainly be preferable to the alternative — which, if taken to its inevitable conclusion, would almost guarantee bloodshed. 9 Comments on "What If Everything We’re Being Told About U.S.-North Korea Tensions Is Wrong?" Of course it is, their lips are moving. Please. The US doesn’t negotiate, they dictate. John Perkins describes the US’ “negotiation techniques” in The Confessions of an Economic Hitman. Very true, though, ultimately, geopolitics is not dictated by the US, it’s controlled by the [Rothschilds’] hidden hand. This is the Dialectic in motion, the Globalists’ oft used tactic to pump up the “Strategy of Tension” for “synthesis” to forge their NWO project. China is KEY to this process and the reason Trilateralist Brzezinski, with his obsession for a totalitarian “Technotronic Era” and following in Trilateralist Kissinger’s [Nixon admin] footsteps, was placed in the Carter admin to spearhead the process of opening up China and begin the process for dismantling America’s manufacturing sector to create the first large scale technocracy. If the US elites were opposed to China gaining economic and global military strength then the Pentagon would have encouraged Chinese troops to enter the “war on terror” in Afghanistan, nor would Trump sit on his hands ignoring Obama’s transfer of the internet over to the UN via ICANN with China already prepared to takeover most of the “management” of the net said to be worth Trillions in data collection alone. China’s Silk Road project is a formal joint undertaking with the UN (UNTACD) designed to cement in regional governance (path to world govt) weakening nation state sovereignty. 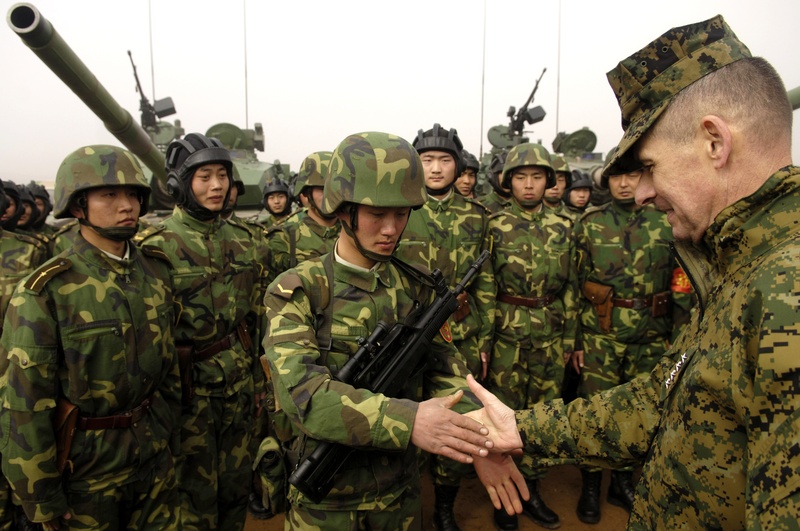 US military brass welcoming Chinese troops in Afghanistan. The timing of the ratcheting up of North Korean tensions by the U.S. is quite interesting. It was done while South Korea was without a President. The new President of South Korea wants to extend the olive branch to the North. Koreans are not evil people. They are just Demonized by the West. The Koreans almost had Independence as a Unified Country after W.W.2. However, America ruined their Dream. The same with the Vietnamese The Vietnamese are not an evil people, but America devastated their Country with Chemical Warfare and then got kicked out. What is happening with North Korea, is that North Korea does not trust a Country that tried to destroy it in the past. Peace was never declared. There is no Truce, and America is still at war. Every Autonomous Country has a right to self-defense. Even Korea. It is a hard long struggle, but America and it’s Allies, still want to defeat North Korea. America still wants to beat the Afghans, Iranians,Chinese and Russians. See how this Childish Game still unfolds in the Pentagon. The Pentagon must be the Biggest Loony-Bin in the whole world. Supported by Banks of course. The Biggest Criminals!